Seeing is Believing This sample manual to teach Upgrading to Office 2010 is in MS Word format. If your trainees are looking for information on the new features of Office 2010, then this bundle of courses is perfect for you. 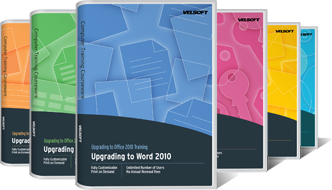 We've created a suite of training courses that focuses on new features and improvements in each Office 2010 program. With this Upgrading to Office 2010 courseware bundle, you'll be able to put on a complete program right away. We've included an instructor guide, exercise workbook, self-study guide, course outline, PowerPoint slides, quick reference guide, and more! Each component is completely customizable so that you can create a program that works for your participants. Get this Upgrading to Office 2010 bundle today and start training tomorrow!